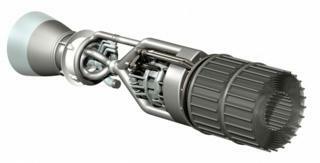 Reaction Engines Limited (REL), the UK company developing a revolutionary aerospace engine, has announced investments from both Boeing and Rolls-Royce. REL, based at Culham in Oxfordshire, is working on a propulsion system that is part jet engine, part rocket engine. The company believes it will transform the space launch market and usher in hypersonic travel around the Earth. The new investments amount to £26.5m. Included in this sum are contributions from Baillie Gifford Asset Management and Woodford Investment Management. It lifts the total capital raised in the past three years to about £100m. The British government has already put in £60m. BAE Systems initially injected £20m in 2015 and has invested new funds in this latest financial round. "Rolls-Royce and Boeing - these are really big names, and it's fantastic to be in this position," said REL CEO Mark Thomas. "Rolls are super-positive about the technology. They want us to be independent and innovative, and to push our technology as hard as possible. And Boeing - that's amazing. They are the world's biggest aerospace company, have decades of expertise and future plans that, for us I'm sure, will be really exciting," he told BBC News. REL is developing what it calls the Sabre engine. This power plant is designed to push a vehicle from a standing start all the way to orbit in a single step. Key technologies include a compact pre-cooler heat-exchanger that can take an incoming airstream of over 1,000C and cool it to -150C in less than 1/100th of a second. This would permit Sabre to use oxygen direct from the atmosphere for combustion instead of carrying it in a tank with the weight penalty that implies. Although Sabre is usually talked about in the context of an orbiting spaceplane, it could also be fitted to a vehicle that flies at very high speed from point to point on the Earth's surface. This is an application that clearly interests Boeing, whose investment arm, HorizonX Ventures, is driving the tie-up in what is its first investment in a UK-based company. "As Reaction Engines unlocks advanced propulsion that could change the future of air and space travel, we expect to leverage their revolutionary technology to support Boeing's pursuit of hypersonic flight," said HorizonX vice president, Steve Nordlund. Those who have followed the REL story over the years will be aware that Rolls-Royce is not really a newcomer to the project. The aero-engine giant was involved in Sabre's precursor years - a spaceplane concept back in the 1980s known as Hotol. When that hit technical difficulties, Rolls-Royce let its interest go, as did British Aerospace. Both are now back, the latter in its current guise as BAE Systems. "We are delighted to become a strategic investor in Reaction Engines Limited, an innovative UK company that is helping push the boundaries of aviation technology," Rolls' CTO Paul Stein said in a statement. "We look forward to working with REL and assisting with the development of their technology, and we plan to incorporate this technology into our own future products." REL is approaching important demonstration milestones. In Colorado this summer, it will begin further testing of the pre-cooler technology, confronting it with conditions that simulate the very hot airstreams encountered when vehicles move at hypersonic speeds. This will be done under contract with the US Defense Advanced Research Projects Agency (DARPA). Also this summer, REL should take control of its new test facility in the UK at Westcott in Buckinghamshire. It is here that the company will mount a demonstration in 2020 of the full Sabre cycle. Assuming this goes well, REL would then look to put the technology on some kind of flight vehicle. The company is expanding fast with more than 160 staff at its Culham HQ. The new investments will allow it to continue the recruitment. "The team here is outstanding. We have some of the most talented engineers I've ever worked with, a high percentage of whom are women engineers; and we have a great apprenticeship programme. It feels like we're a good-news story and I want to keep it that way," said Mark Thomas.